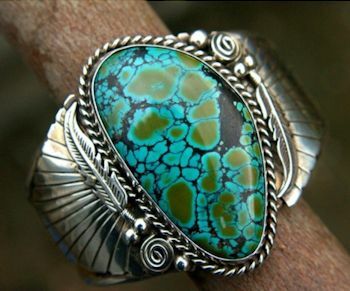 This sterling silver plated ring has a turquoise stone. 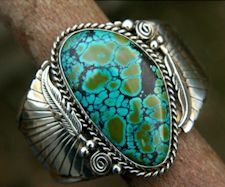 The stone is approximately 7/8" long by 1/2" wide. There is a silver feather on either side of the stone along with some scrollwork. The front shank of the band is approximately 1/2" wide and tapers to 3/8" in back. Copyright © 2019 Native Crafts Wholesale - Now Open to the Public!